Sometimes the lake or creek you target plays a cruel trick. You went in search of bass and everywhere you go schools of catfish and carp roam the water. When you lake hands you lemons, you go catch dinner. Last week I had the opportunity to take my family to a secluded lake in East Texas. I took all of my bass gear, both kayaks and a year’s worth of soft plastics. The weather forecast looked favorable and some much needed on the water time would be accomplished. Upon arrival, I unloaded the family and gear quickly before proceeding to start fishing. Looking around at the shorelines and docks I could see fish activity everywhere. The issue I had: it was catfish. Apparently overcast skies and the barometer drop had the catfish eating. I ignored it for an hour trying to get a bass to take my lures but to no avail. Frustrated I headed in. I reanalyzed the situation. Ultimately I wanted to catch fish, why not catch some to keep and feed the family? I’m usually a catch and release guy but these were catfish and not trophy sized. Why not? I planned on scanning the shore lines for schools and then flipping bait up to them on a weightless line and see what happened. Scouring through what was available I found some corn flakes and Big Red soda and went to mashing and mixing like a redneck Alton Brown. We call the bait PaPa’s bait because he was the one who showed me how to make it. You need to work to get the consistency just right so it will stay on the hook but once you have it, carp and catfish alike will munch it. 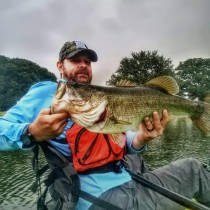 I loosened my drag, tied on a #6 treble hook and boarded the kayak. Silently stalking fish, staring intently behind my sunglasses I could see a fish here, a fish there. I wanted to find the schools. And in short order I did. Standing in my Commander I baited up and made a perfect pitch into the school. The bait slowly sank and then starting moving to the side. HOOKSET! The fight started with aerial flips and fast runs around neighboring brush. I laughed thinking about how much like a small mouth this catfish was acting. I wrangled him through the brush and dipped him up in my net. WOW! The channel cat measured a touch over 18 inches and went into the cooler. The school had dispersed amongst the commotion so I was once again on the prowl. From an onlooker’s perspective I must have looked just like I was flipping shoreline cover for bass. From my perspective I had turned a tough day into a good day really quickly. I ended up with five nice channel cats for dinner. The pattern continued to work throughout the week and on Thursday I got a surprise. A 32 inch carp came to play. I was shaking when I finally got him in the net. What a ride! Like a freshwater redfish. Every time he’d see the net another run would commence. He ended a great week. Next time the bass cafeteria is closed, try stalking the shorelines and sight casting for catfish!